Football, festivals and cooler weather…there’s a whole lot to love about Texas in the fall! Whether you prefer tailgating or wine festing, there’s something for everyone in and around San Marcos. How lucky are we to have the symphony right here in our backyard? The Texas State Symphony Orchestra (TSSO) performs several major concert performances each year, regularly collaborating with internationally renowned visiting guest artists. Fun fact: The symphony orchestra completed a European tour and was invited to perform at the White House Christmas celebration. Take your sweetie out for a night on the town and make it feel like you’re in the big city. The first Saturday of the month means Wimberley Market Days! There’s no shortage of treasure hunting at the 2nd largest outdoor market in Texas. Peruse nearly 500 booths, relax under the tree-shaded paths, enjoy live music and feast on local barbecue. 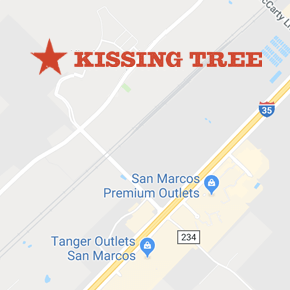 Stop by the Leaning Pear for dinner on your way back home to Kissing Tree – you won’t be disappointed. There really is nothing better than college football, especially when it’s so close to home. Walk around Bobcat Alley, grab a tailgate drink and listen to live music before heading to the stadium. Watch the game and then top off the night at AquaBrew with some seriously delicious pizza and beer. Bring Fido to San Marcos Plaza Park and take part in a celebration of all things pets! Enjoy a festive parade, arts and crafts, pet demos, pet costumes, live music, local vendors and more. The event benefits Prevent a Litter of Central Texas (PAWS), an organization dedicated to ending pet homelessness and pet overpopulation. Did you know the Texas Hill Country is home to one of the fastest- growing wine industries? Fredericksburg is just a short drive from Kissing Tree and the perfect weekend getaway. What better excuse than for the local Food & Wine Festival! Take in the fall weather while sampling wine and small bites from over 25 local wineries in the town’s very own version of Marienplatz.